We’d love your help. Let us know what’s wrong with this preview of A Way to God by Matthew Fox. To ask other readers questions about A Way to God, please sign up. The best part about this book were the quotes from Merton and Eckhart. The worst part was Fox's constant reminder of HIMSELF and his work. Like, was it necessary to point out that you supposedly coined the word "ecumenist?" Ugh. I like Fox's ideas, but his style is frustrating. Through Google preview I was able to read a couple of chapters. I wouldn't have the patience to read the whole book. It is well written. I was introduced to Thomas Merton. Both Thomas Merton and Matthew Fox were influenced by Meister Eckhart. Fox says "Meister Eckhart's thought parallels Buddhist teaching in so many deep ways." I also learned a bit about Creation Spirituality according to Fox. Our relationship with the Universe fills us with awe Through Google preview I was able to read a couple of chapters. I wouldn't have the patience to read the whole book. It is well written. 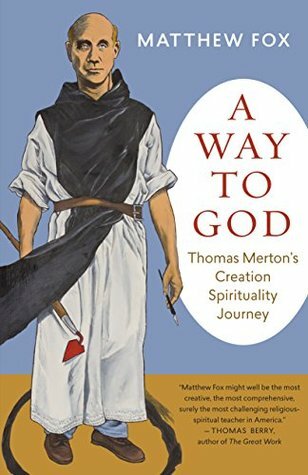 I was introduced to Thomas Merton. Both Thomas Merton and Matthew Fox were influenced by Meister Eckhart. Fox says "Meister Eckhart's thought parallels Buddhist teaching in so many deep ways." I have been very inspired by both Merton and Fox but, after reading two chapters of this book I put it down. More history than I was interested in reading and less inspiration. This is really tiresome because Fox kept referring to his own writings, meetings and thoughts. It read very academic. Maybe it just needed a more exact name. I've always loved Matthew Fox's work for his down-to-earth theology. Interesting to explore Merton's creation spirituality issues with him. Ultimately, if we go back, past the big bang you have to ask who/what laid the Cosmic Egg...and then where did that layer come from. Of course, it can't be answered with the limitations of the human brain but Fox sort of takes you to that place of circling the Mystery. Not always easy reading. Matthew Fox (born 1940) is an American Episcopal priest and theologian. He is an exponent of Creation Spirituality, a movement grounded in the mystical philosophies of medieval visionaries Hildegard of Bingen, Thomas Aquinas, Meister Eckhart and Nicholas of Cusa. His books have sold millions of copies and by the mid 1990s had a "huge and diverse following".